Bleed Eagles Green: Philadelphia Eagles Blog: The Party Has Only Just Started - 2008 NL Champs! 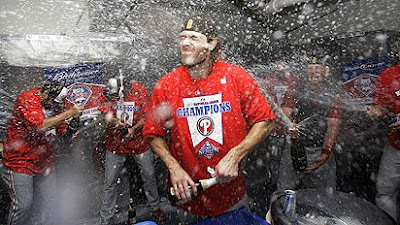 The Party Has Only Just Started - 2008 NL Champs! "Also, this is for the city of Philadelphia. We've got one more step. This is the third step. We've got one more big step and then we're gonna take a Grand Parade." Time to upgrade those 1993 t-shirts! !